Welcome to Dr. Norman Bethune C.I. Parents: Register Your Email Address With Us! To all potential graduates, please check your TDSB email, or AW to access the application form for special awards. Special awards are for a variety of accomplishments and/or school involvement. Applications forms are due Monday, May 6, 2019 at Noon. Please see Ms. Blom in the Library if you have any questions about the special awards application process. New Time Schedule for ONE WEEK ONLY! Bethune will try a different time schedule to assess how a later start may impact traffic congestion and safety in the morning. From April 8-12, the school day will begin at 9:00 am and end at 3:15 pm. 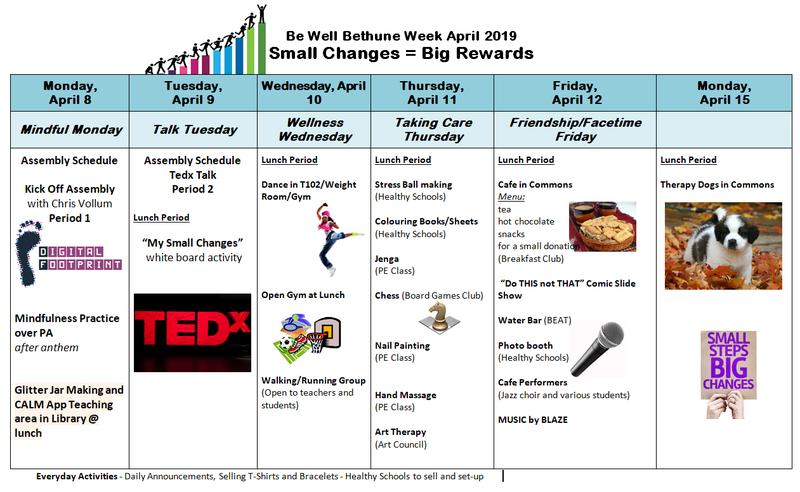 After April 12th, Bethune will return to our regular schedules for the rest of the school year. Unfortunately, Bethune will not be offering the 2 week Bear Camp in July as we have done in the past; however, we are excited to offer a different opportunity for our incoming grade 9 students. Incoming grade 9’s have an opportunity to complete a FULL CREDIT REACH AHEAD course during the month of July at Bethune: BTT1O1. Click here for more details and how to register for this credit. All graduating students must wear a gown and v-stole at commencement this year. If you haven't submitted your payment, please see the main office. It is Course Selection time and we’ll be kicking off the process with our Course Selection Assemblies on Jan 30th. We’ll also be having our Course Selection Marketplace on Feb 6th at lunch. Come and find out about all the courses Bethune has to offer. Come down to the guidance office to speak to your counsellor and do some planning for your education and for your future. Course Selections will be due on Feb 19th for Gr. 9 & 12 and Feb 21st for Gr.10 & 11. Attention all Bethune Students and Parents, this year, payment for the registration fee and other optional fees is on-line. All students received a registration package contained with their June report cards. Students new to Bethune for September 2018 would have either received a package in the mail or would have been given a package at their Elementary school in June. Click here to find information regarding the registration process and schedule for the start of school. Click here to download a copy of the registration paperwork that needs to be completed and returned to the school on the first day. To register online please visit tdsb.schoolcashonline.com . If you have difficulties paying the registration fees online, you can contact the school between August 20 to 29 for assistance or click here to follow step-by-step instructions to set up online payment. At Bethune, student well-being is of great importance. We believe school is a place for everyone to be supported and respected. The Report of Concern is for Bethune students to bring forward issues of concern anonymously. Please advocate for yourself AND others. If you are a parent/guardian, please contact the school directly with your concern (phone or email). Please see the attached letter for tips on staying healthy this flu season!